In the festive spirit of Christmas, I wanted to be able to talk about a movie that I, and maybe you too, watch every year. A Christmas Carol by Charles Dickens has been rewritten and remixed a million times. You see the multiple variations on Hallmark Channel, GMC and ABC Family. I’ve even written my own version of the classic story. Everyone has their favorites, but I’m going to share mine here today. First, let me say the novel is fantastic. It is a classic you cannot go your whole life without reading; I read my well-worn copy every year. “The Marleys were dead to begin with; dead as a doornail.” What a way to start a story, and literally that is the very first sentence in this novel. 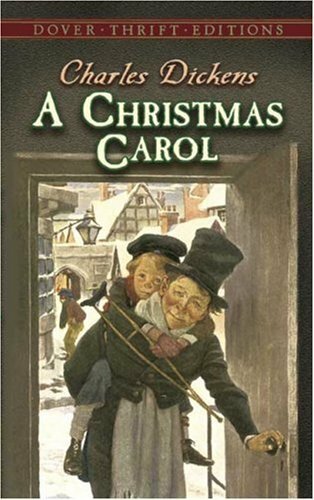 Dickens manages to be both inspiring and frightening simultaneously in this tale of Ebenezer Scrooge, a decrepit and greedy miser. He has alienated his nephew, the only member left of his family, and ostracized anyone else who was remotely interested in getting close to him. His focus is to spend as little money as possible and ignore the plight of those around him, even his faithful clerk, Bob Cratchit, who has a very sick young son. The story is set in the early 1800s, although I’ve seen it modernized in several variations. I have three favorite movie translations of this classic story. The first is the George C. Scott version (1984). I love it primarily for its brilliant acting, as evidenced by the clip I’ve included for you here. But also, it reflects the true heart of the story. Scrooge doesn’t convert too fast, and is deliciously delightful to hate! The screenwriter and director have done a wonderful job of sticking as close to the original story as possible while adding a theatrical element that keeps you from getting bored. The music in this movie steals the show! Man, whoever directed the orchestra in this film knew how to evoke an emotion! The drama is played perfectly; you even catch yourself laughing at the disillusioned Scrooge and his crude, “hum bug” disposition, especially when he’s being mocked. If you liked that clip, you can watch the whole version here. Disney, being the wonderfully talented animators they are, put out their own version of this classic tale in 2010. It is available in 3D, as well as standard DVD and Blu-ray formats. It stars none other than the fabulously versatile Jim Carrey, whom I also loved in Disney’s How the Grinch Stole Christmas. He has a knack for capturing a character and accentuating their strengths and weaknesses. Jim, also being a comedian, has added the traditional humor to the story in places you wouldn’t have expected it, but shows he can also be terrifyingly mean in Scrooge’s notoriously dramatic speeches. Reminiscent of Tom Hanks’ turn in The Polar Express, Carrey plays multiple parts. In addition to Scrooge, you will see him as the Ghosts of Marley, Christmas Past and Present, and young Ebenezer. I will warn parents that although it says Disney, this movie has some very stark and frightening elements that could scare or be too adult for younger children. My absolute FAVORITE version of this book (and ultimately, my favorite Christmas movie PERIOD) is The Muppet Christmas Carol. Yes, it’s the Muppets, which immediately makes it a musical, but this, in my opinion is the best version for children. Like the previous two movies I’ve mentioned, it too sticks very closely to the story, but of course, livens it up in a way no previous story could ever do it. After all, it’s the Muppets! Who can tell a story better than the Henson crew? The Great Gonzo takes the helm as Charles Dickens, narrating the story almost verbatim from the original text of the book. You can’t get more classic than that. The DVD offers an extended version, too, that has some songs and scenes the theatrical version lacked. It also has a “making of” featurette, but if your kids are anything like mine, they won’t want to know the Muppets, or any puppet for that matter, isn’t actually a real person (haha!). Kermit and Miss Piggy are the humble Cratchits and Michael Caine stars as the infamous Ebenezer. Now, I have neglected to include Scrooged (1988) with Bill Murray. I watch this whenever it comes on, and I do love it, but…it strays too much from the traditional version for me. That’s a good thing when you think about this movie and how it was done, and primarily it’s purpose is to be humorous. Even the scary parts turn out to be more funny than frightening. But I love it because it makes me laugh. Alfre Woodard is a brilliant Cratchit spin, and this is one of Bobcat Goldthwait’s best appearances. Again, there’s just too much going on here for this to be one of my favorites, although I do love a good comedy. I have never seen the George C Scott version but it looks fantastic! I'll have to watch it. My favorite one is the Disney version, but you're right about the more adult elements. We went to the movies to see it and my eight year old hid behind her hands the most of the time. This blog sooooo put me in the Christmas spirit! I'm gonna start watching holiday movies right now lol. Saw this on Facebook just now. Wow, this is a great comprehensive view. I watch a version with Vanessa Williams that's really good on Hallmark Channel. I have also seen the Disney version. But I'm gonna check out the other two you mentioned.